Jesus, it seems, is talked about everywhere. Books are written about Him and television specials feature His role in Christianity and the history of the church. But unfortunately, the Jesus who is so often talked about is not the Jesus of the New Testament. These messages expose six lies that are told about Jesus, lies that deny His divinity and attempt to reduce Him to a mere man. 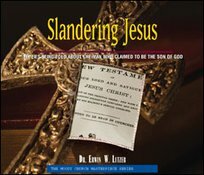 As Jesus grows in popularity with our culture, He is consistently slandered.